Ridden in 2015 to explore some parts of the Alps we'd ridden by or skirted around in the past, this route is an example of how much great riding can be found this part of Europe but is often missed so that we can bag famous cols or ride the best-rated uplift spots. The route was created by linking extended dirt tracks and high cols to valleys and towns for re-supply points. Easy airport logistics were included at each end. The GPS files included alternate routes and side-trip sections so that we could adapt the route along the way. The idea of the 'bike rally' format is about the terrain mix and having a route that can leave some decisions open until you get there or a reason to return again, to vary the route or add that extra loop. One reason for the ride was to test our bikes on mixed terrain, to learn more about bikes that worked well both on road and along rougher tracks. We expected to find some sections that were uncomfortably rough on our chosen bikes (a Surly Troll on 1.75" Marathon Mondial tyres and a one-off drop bar bike with 650B x 48c tyres) - we did - and the current rally route now keeps those to a minimum, but doesn't avoid them altogether. During the ride we carried our bikes for a while a couple of times, stumbled upon some really scenic places via diversions or side-routes and received welcome hospitality when we didn't expect it. The options kept us involved in the route, the mix of road and dirt tracks suiting a wide range of bikes and letting us appreciate the surroundings almost every pedal-stroke of the way. We thought it would make a good group ride for another year and out of that idea came the 1st Torino-Nice Rally in 2016. Like a classic car rally it should be a reliability test, an adventure with friends and a memorable experience. The Torino-Nice Rally starts early in September each year. Entry happens in a haphazard but fair way sometime after January and before May preceding the event. Just pay a bit of attention here or on social media if you'd like to join us. ​The Rally starts early in Turin centre - see Updates section and POI page here, Turin section, for more info. There will be a meeting point for pizza and beer in Turin the night-before. Start as you mean to go on, eh? Between 600 and 700km and around 15-20,000m elevation gain depending on the options taken. Includes : Turin - Colle Finestre - Strada del'Assietta - Briancon - Col d'Izoard or alternate inc Hike-A-Bike / roughstuff to Chateau Queyras - Col Agnel - Colle Sampeyre - Varaita-Maria ridge or road shortcuts toward Stroppo - 'Little Peru' with options for the climb inc more roughstuff - Col de Tende and options of the Via del Sale or the famed Tende descent - More dirt roads to Fort de la Forca - Col de Turini, faster option of road descent towards Sospel - Dirt and roads from near Sospel inc Cols Braus and Madone de la Gorbio with sea views - Coastal balcony roads on the way into to Nice. To ride in a self-supported style in the tradition of other long-distance bikepacking and randonee rides. Not to get hung up on purity of style, unwritten rules of self-supported racing or any other stuff like that. If offered a 3-course meal sharing a 3l bottle of red you'd take it, right? We did. Riding with others is encouraged for all. It's a social ride, not a race. To sleep outdoors wherever possible. It's a beautiful area, even more so during the hours of dawn and dusk. There are also B+Bs and Gites d'Etape along the route as well as 'found shelter' opportunities if you look around. Just select sleeping spots with no-impact ethics and common sense. To enjoy a well-earned steak+frites on the Cote d'Azur, go to the beach, have a swim then get traditionally and economically smashed on not a lot of beer/wine. To freely ignore all but rule #1 and L.N.T practices and do what you like, just enjoy it. General - It's worth knowing the following before riding the route. The Entry Terms include further details for all riders of the actual Rally event. The rally is very much a mountain experience. You will be over 2000m altitude most days and when you go to the mountains you should expect mountain weather. The weather can change fast, things could get serious very quickly and tired, cold riders can make dangerous mistakes on long descents. ​To be at 2500m on a rough track as a storm comes in, with shelter a long descent away, can be a hard way to learn how inadequate cycling clothing can be against bad weather. Bring good waterproofs (preferably with a hood), warm waterproof spare gloves and insulated layers that work when wet - Primaloft gilets or climber's belay jackets for example. Waterproof shorts too, especially if your bike doesn't have fenders (some might say it should have!). Think of the coldest you've ever been on a bike then imagine being that cold on a col at over 2000m. Pack appropriately. The rally may have a friendly atmosphere but the route is not intended for the inexperienced. Many sections of road and track have unprotected drops to the side that could easily be fatal - this is not uncommon in the Alps but may be new to some riders from flatter areas. The roads and tracks go up high and though generally wide rather than single-track they can be very exposed in places. Descents can be steep with loose and uneven surfaces. Traffic may be around any corner, on or off-road - 4x4s, motorbikes and small, well-used Fiats. Ride safe and always think about what may be coming around that blind hairpin. The rally route info includes warning POI/waypoints in the GPS files that are also noted in the cues. Do print and use the cues - they have genuinely important safety information included re. route option considerations based on conditions (as well as good drinking establishment tips). This is not an ideal first touring route for lightweight bikes with thin tyres and rim brakes that get 8-10kgs of gear strapped to them. If you know what you're doing from past experience, all good. If not, best not to find out on day one of the rally. Preparation beforehand will make you a safer rider. Ensure you understand and comply at all times with the rules of the road for cyclists in both Italy and France. This includes visibility at night - lights and reflectives are a legal requirement. You must have suitable liability and accident insurance to ride. In the event of any incident the authorities may need to see your insurance details. There is no way for anyone associated with the rally to account for riders along the route in any way that can offer safety in an emergency. You're truly on your own, acting on your own and this is a good thing to do. Keep a phone power bank in your bag and know the number for emergency services and your location at all times. The Torino-Nice Rally is not a race. It's just not the intent of the event. Ride as fast or as slow as you like or whenever you like, it's your call. Offer help anyone who might need it - asking is the right thing to do. GPS files and formattable cues will be sent out in July to all who have signed-up in advance (3rd TNR sign-ups opening date tbc). Cues will include some but not all points for water and food but only commercial mountain refuges are listed for shelter. The route is expected to take between 4 and 10 days depending on your pace and approach. The 1st rally was completed in good weather in as little as 3.5 days using some of the shorter links, and 4 days using most of the full route. Generally, riders took 5-8 days using a variety of route options. 7-10 days would give you more time to ride the full route at a sociable pace, if you arrive early just relax on the beach for an extra day or two. Much of this depends on your appetite for early starts or long days or your climbing ability. Just adapt the route to your time and pace. The rally isn't a simple 'follow the line' event. There are a route choices to be made from the options supplied as well as scope for further variations, short-cuts or finding supplies and lodging etc that may be of use. The route files don't list all of them. If you study the route in advance you'll be better prepared. On the other hand, it's not a wilderness ride and good judgement on the day may be all an experienced rider needs. We recommend you bring a map of the area to assist with any diversions or re-routes required. It's hilly. Linking high tracks and cols means there is a lot of climbing to be done but it's very much worth it. It's hard-going in places, whether you're on a lightweight CX bike on rougher tracks or a mountain bike on the long road climbs. There's no perfect bike, whatever you ride will have pros and cons and it'll still be fun. 40mm or larger tyres are recommended for the strada sections. You will probably push your bike at one point or another but most of the route is rideable. There is no unavoidable 'death by hike-a-bike' though there are two (optional) sections that require footwork along the way. Only the fittest will ride any of the track to the machine gun nest guarding 'Little Peru' - if you're suffering by then, just be grateful you're not a soldier under fire. Turin and Nice airports are very close to the start/finish points. There are bike shops not far from Nice airport that may provide bike boxes for your return trip. We've bought basic cardboard boxes at Nice airport before (they're thin and without hand-holes though, at 22 Euros not great value for money either). ​There are trains between Nice and Turin that take around 5-6 hours with one change, SNCF or trainline.eu websites have details. If you have more time or are prepared to change train twice there are more options. See Updates page for more info. The Merveilles Tende-Nice train line is worth looking up, it may come in handy during the second half of the ride. Meths, gas and other supplies are available near the start and as the route passes through the first towns - for details see the cue sheet that will be mailed out a couple of months before the start date. GPS files and other info for getting from Turin airport to the start and pre-ride dinner will be clear in mail-out info before the ride. There are many areas on this route that can be very dry in late summer. Wild fires are a very real risk and starting camp fires is not part of participating in the rally. There's no need for fires in the hills - if you fancy a sociable evening around a fire, please find a camp site that has the facilities and don't start a fresh fire spot under any circumstances. Be very careful where you use stoves. In some places stoves and fires will be banned by the authorities with fines for offenders Also see rule #1. Only the wildlife is allowed to 'go' in the hills and leave it there. If you must go, pack it out or use correct methods of site management. Remember that locals might not understand a group of people sleeping in a field within view of their homes. Do not sleep or camp on private or fenced-off land. 'Out of sight is out of mind' and keeps the impact of the ride to a minimum for people living along the route. No business along the way owes us any favours. September is late season and not all tourist businesses will be open. If they've just shut or have stopped serving food please don't be one of a number of riders asking a favour that week. If it's offered, enjoy... and do tip well afterwards : ) There's some wonderfully hospitable businesses along the way that have welcomed hungry riders in the past and the route info will highlight who/where. They deserve our business and the better we all are as customers, the better received we'll all be in future. The Torino-Nice Rally is a free (well, almost) event run on a not-for-profit basis by Torino Nice Rally Ltd. We support a good cause in a small way, for each year's event cloth Torino-Nice Rally patches of the Monte Carlo Rally homage design (the logo at the base of the page) are sold in aid of Smart Shelter Foundation. To get a patch, see the Contact page in the summer each year. For more information on how we hope to help see the Smart Shelter page. Poster artwork by Leigh John, based on pictures of the route. The poster started the creation of the website and the ride followed. 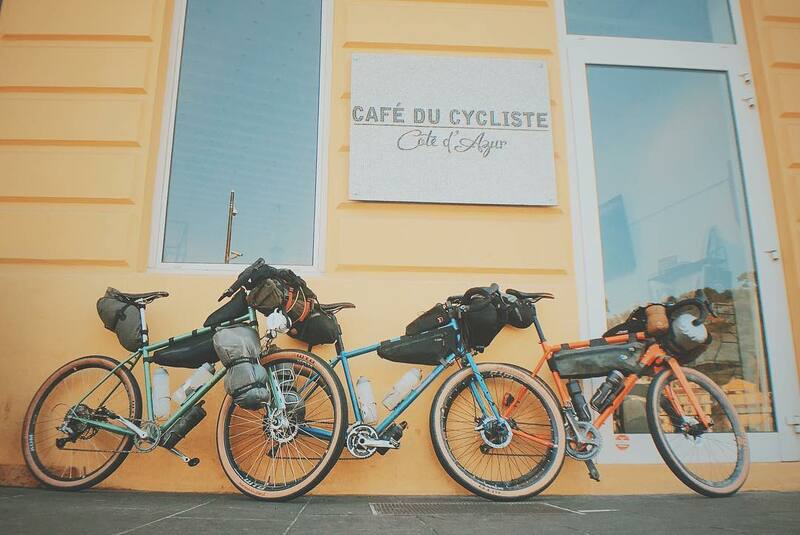 Thanks to Cafe Du Cycliste in Nice (@cafeducycliste_nice) for welcoming riders at the cafe as an unofficial finish point and to Max Leonard (@m_xl) for the introduction there. Look up his books, they're of interest to anyone riding this route. Thanks to Apidura (@apidura) and WTB (@wildernesstrailbikes) for supporting event and the riders of the TNR along the way. © 2018 TORINO NICE RALLY LTD. ALL RIGHTS RESERVED.